Ollie Hynd with his gold medal from last week - picture by onEdition. Kirby ace Ollie Hynd is back in the pool at the Rio Paralympics today as he tries to add to his gold medal from last week by swimming in the S8 100m backstroke. Aiming to better the bronze medal he won at London 2012 in the event, Ollie will go in the heats at 3.04pm this afternoon with the final set for 11.14pm tonight. 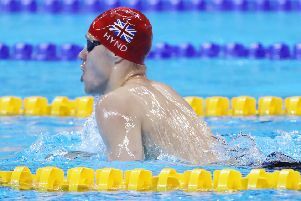 Ollie set a new world record on his way to Paralympic gold in the Men’s S8 400m freestyle on Thursday. The 21-year-old, who trains with Mansfield’s Nova Centurion squad, led from the front to finish first in 4:21.89, in the event he won silver in London 2012. Then on Sunday night he managed a personal best but narrowly missed out on a medal in the S8 100m freestyle last night at the Rio 2016 Paralympics, finishing fourth in a time of 58.85 seconds behind third placed Great Britain team-mate Josef Craig in 58.19. Ollie will defend the Paralympic gold title won in London in the SM8 200m individual medley on Saturday with the heats at 1.52pm and the final at 9.43pm.